I had the pleasure of visiting the Yammer offices in person to meet with the lovely Marta Texidor. Today is all about the issues you can address with this enterprise collaboration tool. 11:45 Marta talks about Yammer and her role in Microsoft. 15:35 What kind of organisations are using Yammer at the moment and the problems they're trying to solve. 25:21 The importance of having Leadership present in the network. How do we involve the CEO and Senior Management? Who can introduce the tool? 35:30 We need to change our mindset to get the most out of these tools. 42:03 - 45:04 We move onto Alan, who's just integrated Yammer into their communications process. We are not just the work we do. Today’s episode is dedicated to an online collaboration tool which I think is really useful for teams. And although I do use online tools, I’m not a roaring fan of them, but I think that they have the potential to improve communication in teams, to help build trust, that elusive thing that Lisette and I will talk about in the next podcast, and to make it a habit for people to be regularly in touch with each other, to encourage people to share information, to find information and to help each other out. 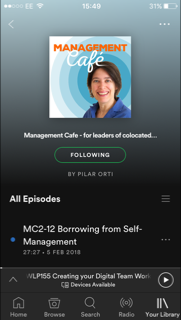 Back to this podcast episode now: , To talk about how these collaboration tools are being used in the workplace, I went to visit Marta Texidor, Marta Texidor, who is Customer Success for Microsoft.to talk about Yammer, which is an “enterprise social network”, that is an online social network platform, for businesses and organisations. Like with many of these tools, I can’t quite remember how I came across Yammer, but it was about 18 months ago. When I saw it I thought, wow, this is great for virtual teams, it’s pretty much like an online office. The interface is very similar to Facebook but the focus is on it being used at work and mainly for work. And here, I need to pause, to say that just as I was writing this script, yes, I still script these, or else I spend hours editing my uhms and erms, when I was getting ready for this episode I saw that Facebook has just launched a Facebook for Work application, so it will be interesting to see in what ways this new product competes with the space of other enterprise collaboration tools. But today, I’m focusing on Yammer, which I’ve already tried out and really like. So, you have the main timeline where you can post something and people reply to you – now the reason why I prefer this to email is that you can see the conversation in chronological order, as opposed to email where you see the last reply first and you have to scroll all the way down to see where the conversation started. Yammer’s got a Praise feature which is mainly used to recognize a job well done publicly, and it’s also got the Like feature, like other popular online network apps, and I think this is a useful thing to have to indicate that you have read something. So, for example, I might go online, see that my colleague Lisette has posted a note saying she has spoken to a client and solved a problem we all had, and I don’t need to reply to say I’ve read it, I can just click on the Like feature. And Yammer also has an in-built chat, so you can see whether people are logged in, and you can chat with them in real time, or you can send them a message. And like in most of these tools, you can turn on and off the email notifications if you don’t want to be alerted every time there’s a post and you can also send your messages through email, if you don’t want to be logging onto the network when you want to post. So, those are some of the things that the tool can do but the most important question is What would you need it for? During my conversation with Marta, she shares how some companies are using Yammer and also the questions that people need to ask themselves before they adopt a tool. Of course, this is key. Pretty much like with any other change in your team, any adoption of a new tool or technology, you need to ask yourself and others lots of questions before deciding whether it’s the right tool for you. To help you with this, I include a short slide presentation where I compare five collaboration tools. When I came across Yammer, I immediately saw the potential for it to be used by virtual teams, by people who are not sharing the same space. It can have that water cooler effect, where people interact informally with each other LINK or where people can ask for help, discuss aspects of their work etc. What I didn’t foresee, however, was how it would be adopted by enterprises, by large companies who have people working for them all over the place, to encourage collaboration. And by that I mean, to encourage people from different parts of the organization to talk to each other, to discover each other’s interests, to share information, and that’s why it’s being described as a collaboration tool. So if you’re a small team, you can use it as your main portal for communication; and in bigger organisations, it can be used to encourage the cross-pollination of ideas and to connect people together who would otherwise never come across each other. If you’re interested in trying out the tool, there is a free version, but you do need a company email address to sign in with. And to get your people to full use the tool with you, everyone needs a company account. although, you can create a Network where you can invite anyone to use it with you. If you want to try the tool, let me know , I can add you to my network, just drop me a comment on this blog post, marked private or send me an email to hello at wlpodcast.com. Because I am part of the Yammer Client Network, which is a network hosted by the Yammer team, so I’ve been able to observe how different organisations are using it, the reasons why they are using it, which are the most important piece of the puzzle, really, and the challenges they are facing because introducing a tool like this into a company or even a team, is a change programme. However, because it’s “just a tool” we think, and I’ve been guilty of this, that we can just add it and that’t it, everyone will start using it and things will be better. But the reality is that it needs a bit of training time, time for people to see how it can improve their working lives or relationship, or their own work. And after that, it needs time for it to be fully integrated into their working process. If we’ve been sending group emails for the last twenty years when we want to run something by our team, we can’t be expected to switch just like that to communicating via a platform. Marta gives us a broad view of Yammer and after that chat, I have also included a couple of minutes of a conversation I had with Alan Inman-Ward about ten months ago, when his team introduced Yammer in the organisation.